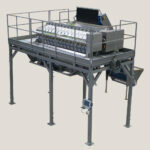 The BSS is your optimal machine for Vertbags and pre assembled extruded net and film. The machine features side sealing to allow more printable space and new cutter guides for a more visible handle and attractive shape. The BSS also has a twist option for delicate fruit, a UV photocell system and a thermo-sealing closure.